The iPhone XS comes in three colors: space gray, silver and a new shade of gold. It's available in capacities of 64, 256 and 512 gigabytes. 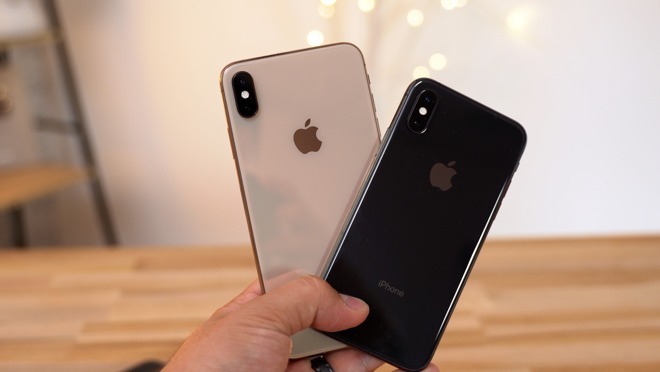 Notably, aside from the difference in screen size, there is no upgrade when jumping from the iPhone XS to the iPhone XS Max — unlike the "Plus" models released in the past, the smaller variant of the flagship iPhone has the exact same camera system as its larger counterpart. For our review, we tested the iPhone XS in space gray with 256 gigabytes of capacity. Having used the iPhone X since it launched last November, that was our main point of comparison, but it should be noted that many (if not most) who buy an XS this year are likely coming from an older model. In comparing the iPhone XS to last year's iPhone X, the main upgrade is the camera system. Specifically, the iPhone XS excels in low-light photos, performing in ways last year's flagship model simply could not. Immediately upon testing the iPhone XS camera in dark and dim settings, we found that its ability to capture high quality images in otherwise poor conditions was greatly improved. We did find that color accuracy could be sacrificed in these lower light images — one photo captured at an outdoor concert gave the ambient lighting a greenish hue that was not visible to the naked eye. However, the results still wowed. After sending one image to a friend, their first reaction was, "Wow, you shot that on a phone?" This impressive low light performance is made possible by a number of significant changes to the camera system, including an image sensor that is somehow 30 percent larger than last year's model, despite the phone itself being the same thickness. The iPhone XS camera also captures 1.4m pixels, and features a new Smart HDR mode that combines a number of exposures into one. Apple has also reduced shutter lag and increased the number of focus pixels over the iPhone X, with a revamped system powered by the handset's beefy A12 processor. And the improved lenses feature dual optical image stabilization, meaning shots are less blurry in both photos and video. 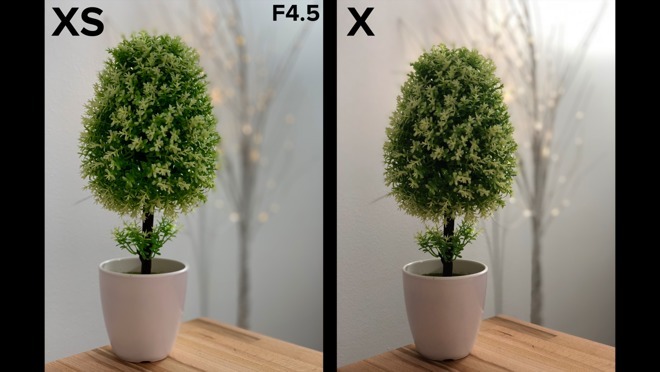 When shooting in Portrait Mode, a new "Depth Control" feature allows users to adjust the bokeh effect as well as increasing or decreasing the background blur of an image. This is made possible because Portrait images are created with some digital trickery, mimicking the capabilities of a high-end camera lens through software. In practice, this new feature works quite well, adding a new layer of granular control that photographers will appreciate. 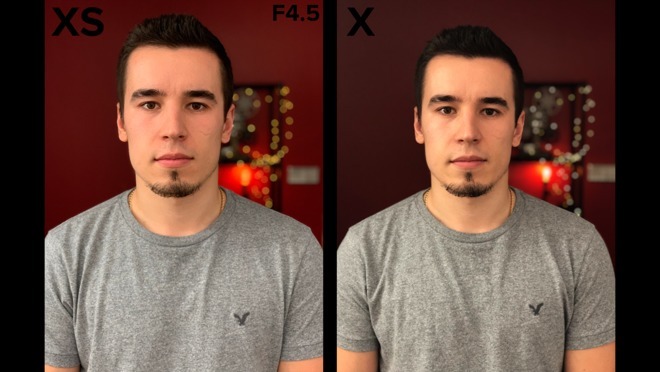 The Portrait system is still imperfect — what it chooses to focus on in the foreground can be hit or miss — but shows signs of improvement from the iPhone X, and generally provides excellent results. Video recordings are also enhanced by new stereo capabilities. Our tests found that audio was noticeably improved when recording video, though the video itself appeared mostly the same (and still excellent). In fact, sometimes we find ourselves deferring to recording video and using the image capture tool in Apple's Camera app to get the best results — a testament to how well the 4K video footage looks when captured at 60 frames per second. Finally, around front, the TrueDepth camera is mostly the same, though Apple says it has made some software tweaks to improve the Face ID login functionality. In daily use, we felt no discernible difference in Face ID performance in migrating from the iPhone X. It should also be noted that iPhone X users gain some Face ID improvements through the iOS 12 update. After using Face ID for the last 10-plus months, we continue to think it's a rock-solid replacement for Touch ID. The iPhone XS camera is an impressive achievement, capturing stunning photos with minimal effort. It is the main and most notable upgrade when compared to last year's iPhone X. If you shoot a lot of low-light photos and have found that the iPhone X wasn't quite up to snuff, the iPhone XS will be a welcome improvement for you. Apple continues to perform laps around the competition with its custom silicon, with this year's A12 Bionic chip boasting a next-generation Neural Engine with eight cores within the iPhone XS, up from just two cores in the A11 chip in last year's iPhone X. In terms of raw performance, the A12 Bionic posted a single-core score of 4,817 in Geekbench, and the multi-core score reached 10,716. The 7-nanometer chip's GPU also posted a Metal score of 21,907. In comparison, benchmarks from last year's A11 Bionic in the iPhone X showed a single-core score of 4,274, a multi-core score of 10,438, and a Metal score of 15,540. The significant bump in Metal score is particularly noteworthy as Apple is now building its own custom GPUs as part of its A series processors. The company is once again flexing its chipmaking muscles with tremendous year-over-year increases in performance, leaving the rest of the industry in the dust. In terms of actual daily use, iPhone X users won't notice much of a difference. Apps launch slightly faster, but not in a meaningful way. But again (and this is a common theme here) if you're coming from an iPhone 7 or earlier, the iPhone XS will be a major leap forward. Where the power of the A12 is really, truly felt, oddly enough (and this is another common theme for the iPhone XS) is the camera. The iPhone XS, when compared to the iPhone X, is all about the camera. All of the praise we have for the improvements in camera can be partially credited to the A12 Bionic chip, helping to enable features like Portrait Depth Control, Smart HDR, and reduced shutter lag. Sure, the A12 Bionic helps in other ways, including noticeable improvements in augmented reality apps. But aside from relying on iOS 12's Measure app a handful of times, we find ARKit apps are mostly an impressive tech demo laying the groundwork for a presumed Apple AR headset somewhere down the road. For now, Apple is leveraging the power of its chipmaking prowess to push mobile photography forward, and that's where the A12 Bionic and iPhone XS shine. The iPhone XS display is, to our eyes, unchanged from the iPhone X screen. If you're coming from a different Apple handset and are curious about the screen, it's gorgeous. If you're coming from a home button-based iPhone and are concerned about Face ID and the swipe gesture to unlock the handset or return to the home screen, fret not. Swiping to return home and a long swipe for multitasking are intuitive and will make you quickly forget you ever used a home button. In fact, try going back to your old phone after a few days of use and you'll find yourself instinctively swiping to no avail. Face ID is also a rock solid biometric solution, working reliably and in situations where you might expect it to fail. That's not to say it's perfect — there are situations where sunlight or the wrong pair of glasses will cause a problem. But frankly, Face ID outperforms the home button in this respect too, as Touch ID failed with sweaty or wet fingertips, and was completely unusable with gloves. Face ID is a definite improvement from Touch ID, and it continues to shine on the iPhone XS. In a way, the fact that the screen and Face ID system are largely unchanged from the iPhone X is a testament to how great of a job Apple did getting it right when it completely shook up the iPhone's iconic design in 2017. There was no need to go back to the drawing board. The Face ID notch, however, is still the same, for better or for worse. It's certainly not attractive, but it's a necessary evil to achieve the design and functionality offered by the iPhone XS. 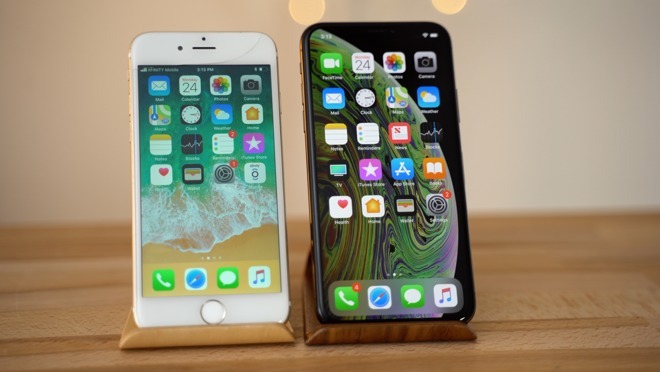 The radios in the iPhone XS have been upgraded with "Gigabit LTE," and tests show the performance difference can be significant, to the tune of a 266 percent leap from the iPhone X. This, of course, presumes your network is actually working. While out for a day in the park, AT&T's connection was struggling in Brooklyn, despite the fact that the iPhone XS was showing three-plus bars of strength. When it works, it's fast, but that still can't fix the fact that overcrowded networks in major metropolitan areas can still be problematic in 2018. 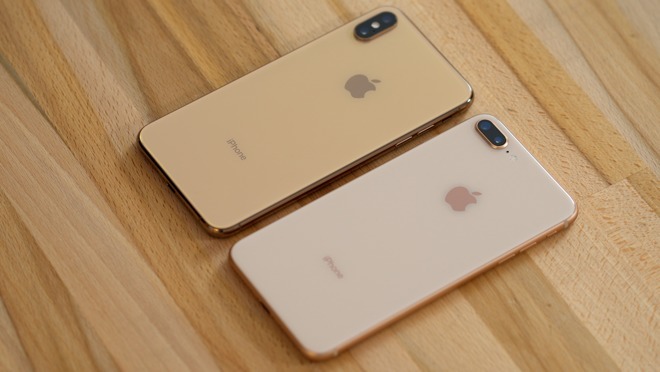 As with last year's handset, the iPhone XS also includes 802.11ac Wi-Fi and Bluetooth 5.0 technology. It also has near-field communication to enable Apple Pay tap-to-pay functionality at retail stores. But in a potentially significant change, the iPhone XS and its NFC capabilities gain a new feature called "Express Cards with power reserve." I'm particularly excited for this feature, as it could help lead to more NFC-based building access and public transit. Ask anyone about possibly replacing their entire wallet, their house keys, or even building access cards with their smartphone, and you'll get a common response: "What if my battery dies?" With the iPhone XS, Apple is addressing that concern, potentially paving the way for wider adoption of NFC-based access cards. In short, if your iPhone battery dies, supported NFC cards — certain transit cards in Asia and ID cards at a few colleges in the U.S. — can still be used in an ultra-low-power mode, ensuring you can still get on the subway or bus, or enter your building. In a perfect world, our iPhones would run forever and never need to be charged. In reality, the laws of physics mean you'll still be charging your phone every night. Though Apple users have griped about iPhone battery life for years, much of that chatter has died down since the release of the iPhone X. With power efficiency improvements from Apple's custom processors and advantages due to an OLED display, most users have no problem getting a full day out of the iPhone X. The situation is slightly better with the iPhone XS, as Apple says this year's model lasts up to 30 minutes longer. In our first few days of testing, we had no problem with the iPhone XS battery despite heavy use. Not once did our battery indicator turn red or approach zero. That said, the fact that Apple continues to ship a one-thousand-dollar-plus phone with a dinky little USB power adapter is a complete joke. Yes, we understand that switching to a USB-C-based connector in the box could confuse or upset some customers, but there has to be a compromise here, particularly when you consider that a cheap $10 wireless charger on Amazon will juice your iPhone faster than the adapter that ships in the box. On my desk, I use the 29-watt power brick Apple ships with the 12-inch MacBook, along with a USB-C to Lightning cable, to take advantage of quick charge capabilities on my iPhone and iPad. While the 29-watt power adapter is not necessary for an iPhone, Apple needs to at least offer better charging capabilities out of the box, particularly for its premium, pricey handsets. The lack of a Lightning to 3.5-millimeter headphone adapter is another disappointment in terms of what's in the box, but it's far less offensive than the cheap charger. Apple needs to do better. That said, if you're equipped with the right charging equipment, it's easy to top off your iPhone XS in a short amount of time. The fast-charge functionality offers up to a 50 percent charge in 30 minutes. Just be prepared to drop some extra coin to get that capability. Of course, we can't go without mentioning the jumbo-sized iPhone XS Max and its massive 6.5-inch display. For our hands, the 5.8-inch screen on the iPhone XS is already pushing it, creating problems with one-handed use (especially when invoking Control Center or Notification Center with swipes from the upper edge). However, it's clear that there is a significant market for gigantic phones that require two hands to use. The iPhone XS Max also offers better battery life, to the tune of an hour and a half longer than the iPhone X, and an hour longer than the iPhone XS. This is possible because the larger form factor allows Apple to fit in more battery. For some, the giant screen will be appealing, and some just want more battery life. Priced at just $100 more than the iPhone XS, we see the iPhone XS Max as a decent value. But as we noted previously, both devices boast the same camera, which is a welcome change from the Plus era of iPhones. That means if you opt for the more manageable form factor, you won't be sacrificing picture taking capabilities. Here's hoping this equality trend continues with future iPhones. Things aren't so equal, however, if you step down to the iPhone XR, which arrives next month. Apple's budget-priced option for 2018 steps down to an LCD display, has larger bezels around the screen, and it doesn't have the same two-camera system with a telephoto lens. At $750, the iPhone XR will undeniably be appealing to a huge number of consumers who simply can't stomach the $1,000-and-up pricing of the iPhone XS series. It's also a major push for the company's edge-to-edge screen design and a full-on embrace of Face ID. If you're considering between getting the iPhone XS now or waiting for the more affordable iPhone XR, once again, it's all about the camera. While the single-lens design of the iPhone XR has been tweaked to offer Portrait mode (previously only available on dual-lens handsets), it still lacks 2x optical zoom, and is limited to a /1.8 aperture. Still, with the A12 Bionic chip, Face ID, and a 12-megapixel lens, the iPhone XR packs a formidable punch. 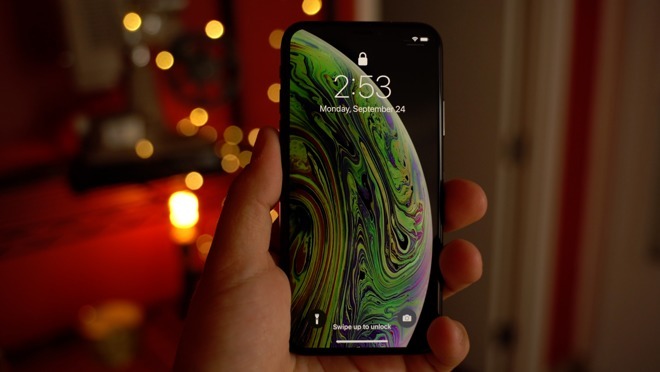 For some, the deciding factor could be size, as the iPhone XR has a rather large 6.1-inch display, besting the 5.8-inch screen on the iPhone XS. 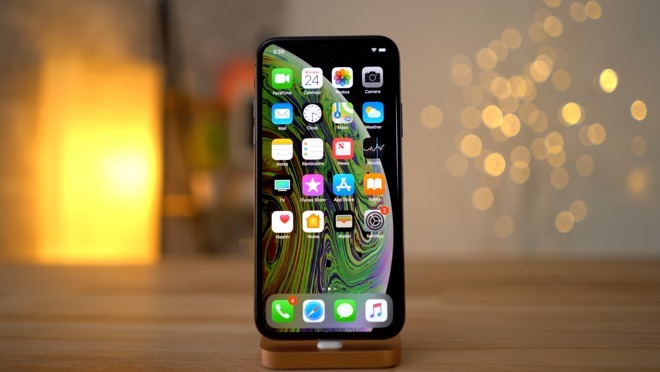 Some consumers may find the 6.1-inch display to be appealing, but for those looking to get the most from their smartphone in the smallest possible pocketable form factor, the iPhone XS remains the way to go. 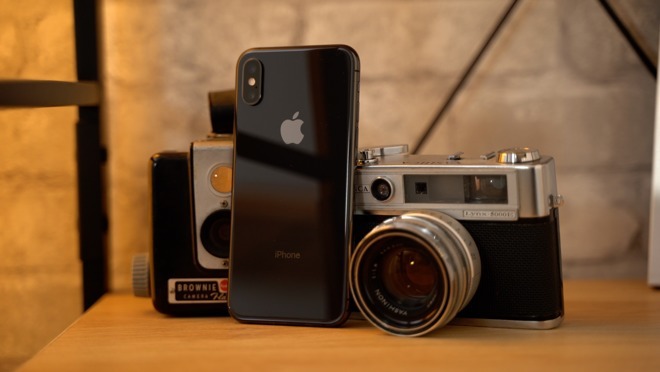 When directly compared to the iPhone X, the iPhone XS is a modest upgrade with welcome and significant improvements to the camera, helped by a new camera system and advanced processing unlocked by the A12 chip. It's definitely an improvement, but probably not worth dropping $1,000 a year later. 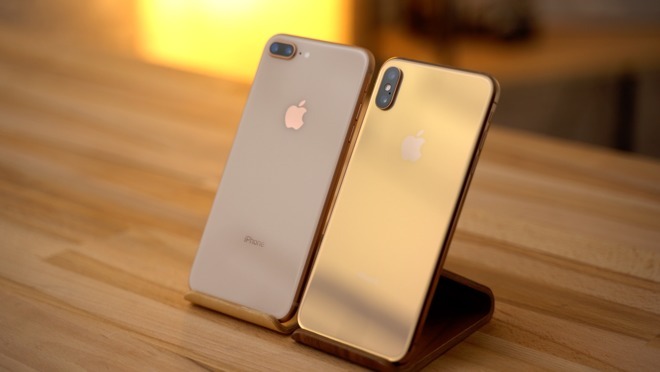 Things get a little bit more complicated, however, if you're using the iPhone Upgrade Program, where you pay for the handset and Apple Care in monthly installments. You can trade in your phone and upgrade now, and continue to pay the same amount, as though you are leasing a car. If you wait another year, you'll still be paying the same amount, and if you buy the 2019 model... you'll still be paying the same amount. The iPhone Upgrade Program makes updating every year something of a no-brainer, unless you plan to go 3 or 4 years without updating your iPhone. And if you have an iPhone X, you very well could go 3 or 4 years and be happy. But if you are the type to upgrade every 2 years, and you buy Apple Care already, you're probably better off just joining the upgrade program and getting a shiny new handset every year. If you're a customer who upgraded last year, but opted for the iPhone 8, choosing between the iPhone XS or XR is a bit more difficult. Then it's simply a matter of deciding whether the camera improvements are worth $250 to you, and whether you want a larger 6.1-inch display. If you upgraded to an iPhone 8 Plus last year because you wanted to keep the giant display, and not because of budget concerns, you're probably a good candidate for the iPhone XS Max. Yes, $1,100 is pricey, but the gorgeous 6.5-inch display will satisfy your jumbo screen needs, and the improved camera along with the jump to an OLED edge-to-edge display will make it a worthwhile upgrade. Finally, if you're on an iPhone 7 or older, the decision is a little more complicated. You will undoubtedly be happy with an iPhone XS or iPhone XS Max, if you're OK with the price. If paying $1,000 for a phone sounds like too much for you, you're probably best waiting for the iPhone XR, as it offers many of the benefits of the iPhone XS series with a more palatable cost. Plus you'll have the option of a number of fun colors. If you do decide to take the leap up to a more premium handset and go for the iPhone XS, you most certainly will not be disappointed. And if you're not the type to upgrade every year, the iPhone XS will undoubtedly serve you well for years to come, with its groundbreaking design and formidable hardware built for the future. Last year with the iPhone X, Apple made a giant leap forward and completely shook up its iPhone lineup. This year, the rest of the lineup is taking cues from the groundwork laid by the iPhone X. The iPhone XS isn't another giant leap — it's continuing down the path forged by Apple's brilliant rethinking of the entire iPhone platform, with a significantly improved camera thrown into the mix for good measure. 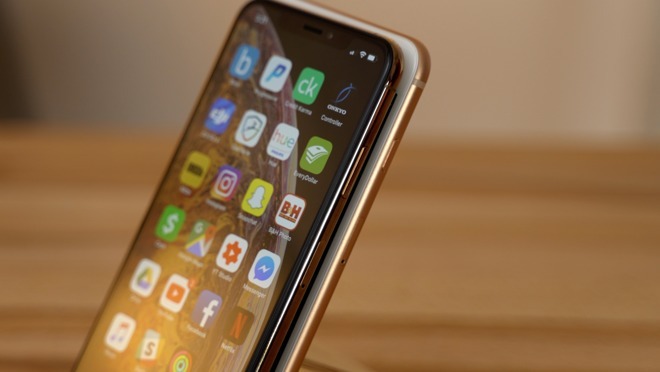 Viewed as a modest update continuing along a trailblazing path, the iPhone XS is another big win for Apple. If you haven't already ordered Apple's iPhone XS, wireless carriers are incentivizing the purchase with buy one, get one $700 off promotions and more. Want to get your hands on the iPhone XS asap? eBay sellers are also shipping units now. Verizon Wireless: Buy one iPhone XS or iPhone XS Max, get a second $700 off when you add a line. Or save $100 with an eligible trade.